Benzodiazepines (BZD), sometimes called "benzos", are a class of psychoactive drugs whose core chemical structure is the fusion of a benzene ring and a diazepine ring. The first such drug, chlordiazepoxide (Librium), was discovered accidentally by Leo Sternbach in 1955, and made available in 1960 by Hoffmann–La Roche - which, since 1963, has also marketed the benzodiazepine diazepam (Valium). In 1977 benzodiazepines were globally the most prescribed medications. Benzodiazepines enhance the effect of the neurotransmitter gamma-aminobutyric acid (GABA) at the GABAA receptor, resulting in sedative, hypnotic (sleep-inducing), anxiolytic (anti-anxiety), anticonvulsant, and muscle relaxant properties. High doses of many shorter-acting benzodiazepines may also cause anterograde amnesia and dissociation. These properties make benzodiazepines useful in treating anxiety, insomnia, agitation, seizures, muscle spasms, alcohol withdrawal and as a premedication for medical or dental procedures. Benzodiazepines are categorized as either short-, intermediate-, or long-acting. Short- and intermediate-acting benzodiazepines are preferred for the treatment of insomnia; longer-acting benzodiazepines are recommended for the treatment of anxiety. 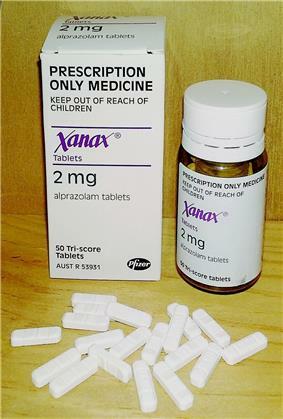 Benzodiazepines are generally viewed as safe and effective for short-term use, although cognitive impairment and paradoxical effects such as aggression or behavioral disinhibition occasionally occur. A minority of people can have paradoxical reactions such as worsened agitation or panic. Long-term use is controversial due to concerns about adverse psychological and physical effects, decreasing effectiveness, and physical dependence and withdrawal. Due to adverse effects associated with the long-term use of benzodiazepines, withdrawal from benzodiazepines, in general, leads to improved physical and mental health. The elderly are at an increased risk of suffering from both short- and long-term adverse effects, and as a result all benzodiazepines are listed in the Beers List of inappropriate medications for older adults. When benzodiazepines were first introduced, they were enthusiastically adopted for treating all forms of epilepsy. However, drowsiness and tolerance become problems with continued use and none are now considered first-line choices for long-term epilepsy therapy. Clobazam is widely used by specialist epilepsy clinics worldwide and clonazepam is popular in the Netherlands, Belgium and France. It was approved for use in the United States in 2011. 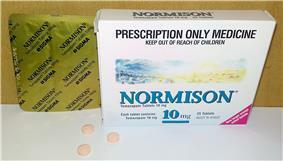 In the UK, both clobazam and clonazepam are second-line choices for treating many forms of epilepsy. Clobazam also has a useful role for very short-term seizure prophylaxis and in catamenial epilepsy. Discontinuation after long-term use in epilepsy requires additional caution because of the risks of rebound seizures. Therefore, the dose is slowly tapered over a period of up to six months or longer. chlordiazepoxide, clorazepate, diazepam, flurazepam, halazepam, prazepam, and others. 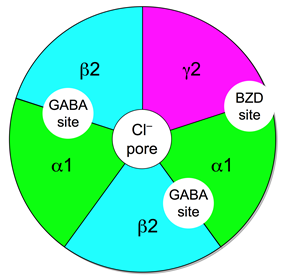 Figure of the GABAA receptor complex where the five subunits (two alpha, two beta, and one gamma) are symmetrically arranged in a pentagon shape about a central ion conduction pore. 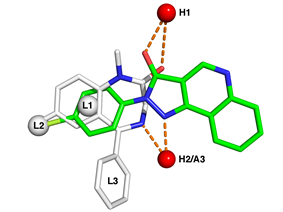 The location of the two GABA binding sites are located between the alpha and beta subunit, while the single benzodiazepine binding site is located between the alpha and gamma subunits. 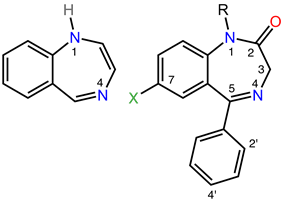 ^ CAS registry number:; other names: Ro 05-2921, dechlorodemethyldiazepam.